Centralized logging: Allows you gather logs from all components in the OpenStack environment in one central location. 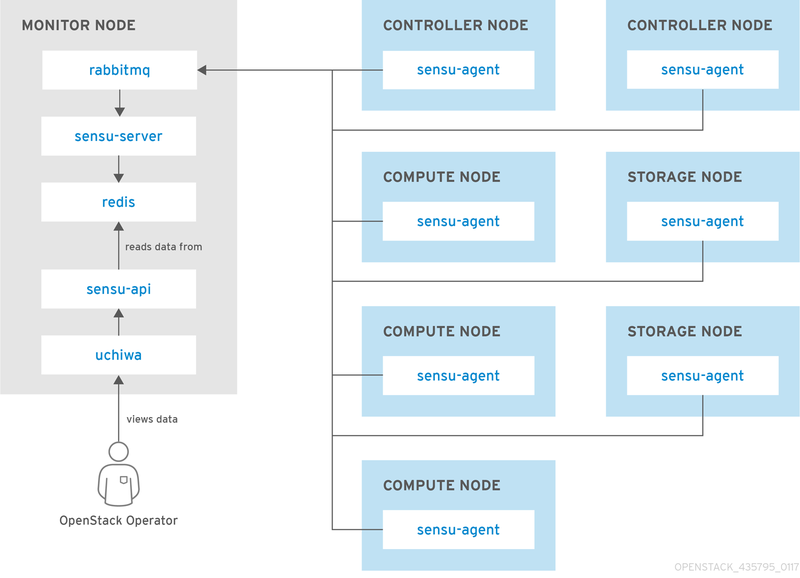 You can identify problems across all nodes and services, and optionally, export the log data to Red Hat for assistance in diagnosing problems. Availability monitoring: Allows you to monitor all components in the OpenStack environment and determine if any components are currently experiencing outages or are otherwise not functional. You can also receive notifications when problems occur to optimize your response time. 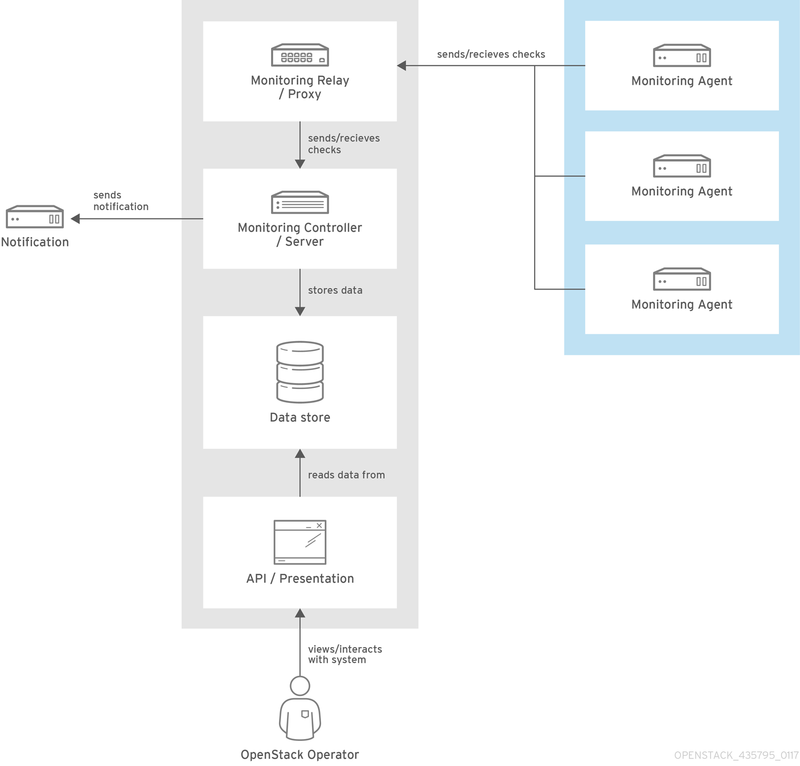 Monitoring tools use a client-server model with the client deployed onto the Red Hat OpenStack Platform overcloud nodes. 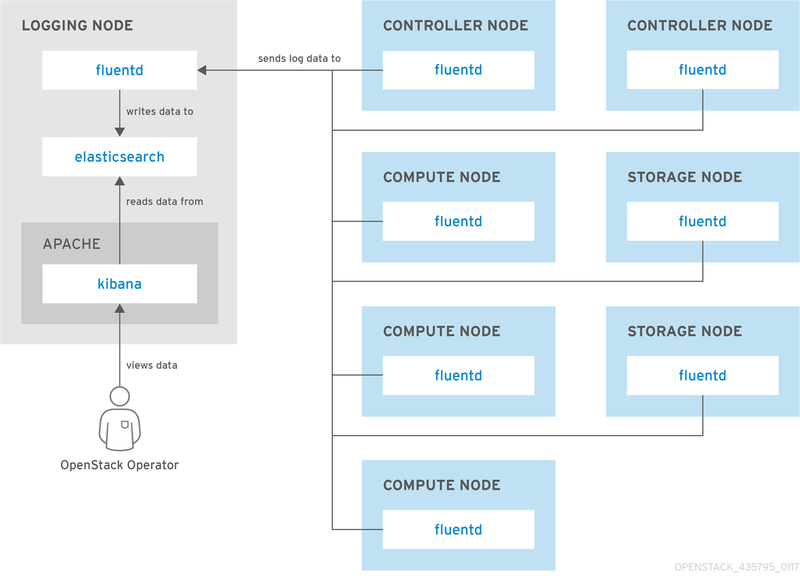 The Fluentd service provides client-side centralized logging (CL) and the Sensu client service provides client-side availability monitoring (AM). Centralized logging allows you to have one central place to view logs across your entire OpenStack environment. 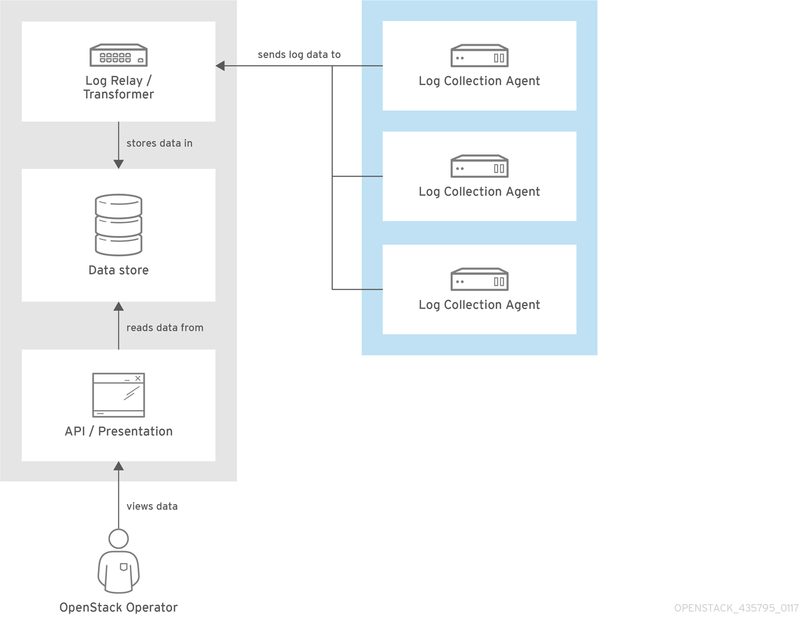 These logs come from the operating system, such as syslog and audit log files, infrastructure components such as RabbitMQ and MariaDB, and OpenStack services such as Identity, Compute, and others. The director does not deploy the server-side components for centralized logging. 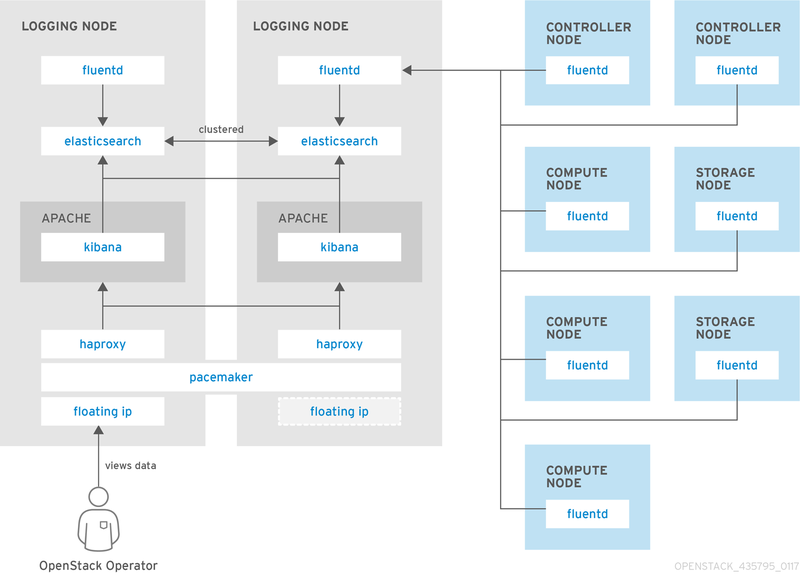 Red Hat does not support server-side components including the Elasticsearch database, Kibana, and Fluentd with plugins running as a log aggregator. Items shown in blue denote Red Hat-supported components. Availability monitoring allows you to have one central place to monitor the high-level functionality of all components across your entire OpenStack environment. The director does not deploy the server-side components for availability monitoring. Red Hat does not support server-side components including Uchiwa, Sensu Server, the Sensu API plus RabbitMQ, and a Redis instance running on a monitoring node. Prior to overcloud deployment, you need to determine the configuration settings to apply to each client. Copy the example environment files from the director’s Heat template collection and modify them to suit your environment. LoggingServers - The destination system that will receive Fluentd log messages. LoggingUsesSSL - Setting that determines whether secure_forward is used when forwarding log messages. LoggingSharedKey - The shared secret used by secure_forward. LoggingSSLCertificate - The PEM-encoded contents of the SSL CA certificate. 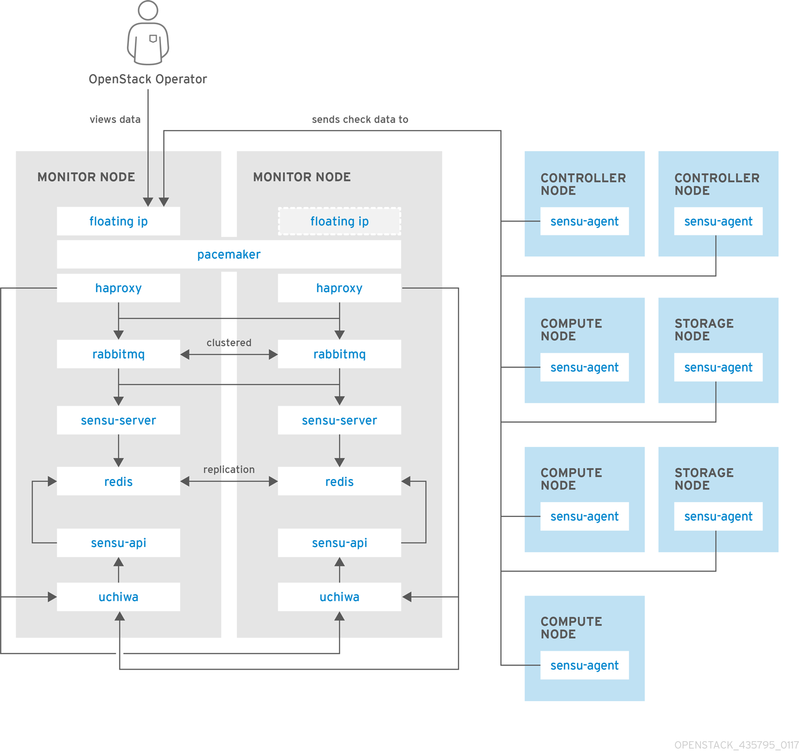 MonitoringRabbit* - These parameters connect the Sensu client services to the RabbitMQ instance that runs on the monitoring server. MonitoringRabbitUseSSL - This parameter is not currently available for availability monitoring. SensuClientCustomConfig - Specify additional Sensu client configuration. Defines the OpenStack credentials to be used, including username/password, auth_url, tenant, and region. Red Hat does not support the server-side components and their deployment process. OK: Got a token, Keystone API is working. Verify that each overcloud node has the /etc/sensu/conf.d/rabbitmq.json file that sets the IP address of the monitoring server. Login to the Uchiwa dashboard and click the Data Center tab to confirm that the Data Center is operational. Check that all overcloud nodes are in a Connected state. At a suitable time, reboot one of the overcloud nodes and review the rebooted node’s status in the Uchiwa dashboard. After the reboot completes, verify that the node successfully re-connects to the Sensu server and starts executing checks. This example tests the monitoring of the openstack-ceilometer-central service. Connect to the Uchiwa dashboard and confirm that a successful ceilometer check is present and running as defined in the ceilometer JSON file. This may disrupt services, so run this test at an appropriate time. Log in to the Uchiwa dashboard and confirm that the failed ceilometer check has been reported. Log in to the Uchiwa dashboard and view the time interval between the ceilometer check reports to confirm that the check runs in the time interval defined in the ceilometer JSON file.